Table Groups are an extension of the Lord’s Table into our own homes. Table Groups offer a meaningful place of belonging where we meet together for a communal meal, a time of sharing and discussion, and common prayer. 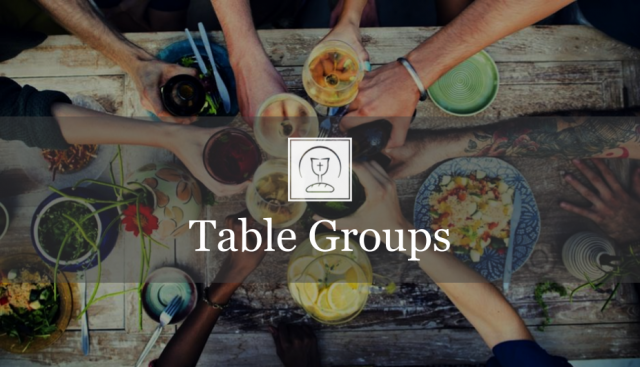 Table Groups are a place of formation, fellowship, and Christian hospitality, where we explore what it looks like to live all of life in reference to Christ. What happens at a Table Group? Table Groups are a weekly gathering of small groups of people (6-12) from our church community. The “liturgy” of the Table Group consists of three things: a shared meal, discussion of Scripture, and Evening Prayer. The shared meal is always done as a coordinated potluck style. We generally discuss the passage of Scripture that was preached on the Sunday before. And we always take time to pray for each other and our needs during Evening Prayer. Leading a Table Group is a wonderful way to serve our church. There are expectations that our church has for our Table Group leaders. If you are interested in leading, you can learn more about our expectations here. We currently have five weekly Table Groups which meet throughout the city and in the East Bay. We are actively starting new groups across the city. We hope to one day have Table Groups in every neighborhood in San Francisco and throughout the Bay so that every can be connected to others in their own geographic context. What are ways I can get involved? There are two ways to get involved outside of leadership! First, if you have a dinner table, you can host a group! We will work to provide leaders so that you can actively serve the community by opening up your home. For more information about hosting a group, see our expectations for hosts here. If you want to help thicken your sense of community and belonging, we encourage you to join a Table Group near you! You can see the expectations of a Table Group participant here.